As a reputable home inspection firm we provide quality home inspections in Eastern Newfoundland & Labrador, including the Avalon Peninsula, St. John’s, and Mount Pearl. In addition we can travel all over Newfoundland if needed, including both Central and Western Newfoundland, and the Burin and Bonavista Peninsulas when requested. We have been providing Professional Inspection services since 1995, and assist Home Buyers, Home Sellers, and Realtors by providing an accurate and unbiased report on the home condition. Pillar To Post – Eastern Newfoundland & Labrador offers industry experience which can really make a difference. Until 2009 when Edward Mercer Jr. joined his father at the company there was only a single inspector, Ed Mercer, who has extensive industry experience and knowledge. This has been passed down to the next generation evolving our company into a family oriented business. We treat each client like a family member and friend, as well as a valued customer. Our experience covers all types and ages of homes, from older historic structures to new construction and homes built to spec. We also have inspection experience with small commercial properties. We are expected to provide information and knowledge along with an accurate inspection report which is unbiased, and our clients place incredible trust in our services. This is a trust that we hold highly. Each home inspection that we conduct can range from two to four hours on average, and we welcome client participation and questions throughout the process. We take pride in educating our clients about their new homes and providing the peace of mind necessary to make the biggest purchase of their lives. For this reason, we encourage our clients to accompany us during the inspection so we can take time to point out and explain any findings to them. The services we provide can help ensure that the home people live in are safe. Upon completing the inspection a detailed report with color pictures will be provided to the client. We are available to answer any questions even after leaving the site, and will take all the time needed to explain the findings and answer any questions that come up during and after the inspection. 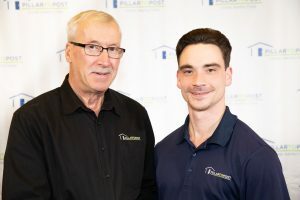 As the local Pillar To Post Home Inspector and Franchise owner, Ed Mercer is very community-minded and industry involved. 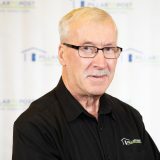 Registered Home Inspector and an active member of Canadian Association of Home and Property Inspectors, Atlantic Division. Member of the Association of Engineering Technicians and Technologists of Newfoundland and Labrador. Over forty years of experience in major buildings construction, road construction and water & sewer projects. Registered Home Inspector and an active member of the Canadian Association of Home and Property Inspectors, Atlantic Division. We regularly receive feedback and praise from our customers about our home inspection services. They report that we are very thorough in the details of our services, and leave our customers with no question left unanswered. Our “all for the customer” attitude gains us respect with our customers. This attitude also leaves our past customers with no doubt in their mind that they can pass our name along to their friends, family, co-workers, and clients, knowing that we will carry out the same thorough and professional inspection they received during their home buying process. Clients are extremely satisfied with our inspection reports. Testimonials from past clients show that they feel our reports exceed all aspects of what they had expected from the home inspection process. Clients find our reports easy to read and full of useful tips and recommendations that can assist anyone, from a multi-property owner to a first time home buyer. The digital photos incorporated within our reports make it easy for a client, who may not be able to be present during the inspection, to make the decisions necessary to purchase the home of their dreams. The knowledge we provide our clients about the property they are purchasing allows them to be at ease when making the decision on whether or not this is the home for them.